The limited capacity of Talkatora stadium, 2700, ensured there was never going to be a problem to fill it to the rafters, but still the consistent full house pleasantly surprised the boxers. The pugilists conceded that the constant cheering and chanting by the home crowd kept their spirits high even in difficult bouts and played an important role in making history. But the Indians were not the only ones scripting a new chapter at the Games. Sri Lanka got their first boxing Gold medallist in 72 years when 31-year-old Manju Wanniarachchi finished on top in the Bantamweight (56kg) category. Wanniarachchi also became the first boxing medallist for Sri Lanka in 60 years and his triumph had an Indian connection to it as he had made several training trips to the National Institute of Sports in Patiala during his long career. Barney Henricus was the last Sri Lankan to win a Commonwealth Games Boxing gold – at the British Empire Games in Sydney in 1938. The Island nation's previous Games boxing medals were two Silvers and a Bronze in Auckland in 1950. 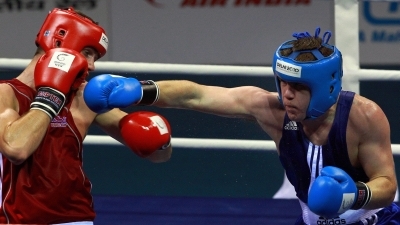 Northern Ireland, which had not won a Commonwealth Games boxing Gold for16 years, also collected three this time to tie with India and record their best result in the sport since hauling in a pair of Gold and Silver medals at the 1994 Games in Victoria, Canada. The Northern Irish finished on top of the table in the ring sport by virtue of winning two Silver medals while India had four Bronze medals to their credit. European champion and Olympic Bronze-medallist Paddy Barnes (49kg), Patrick Gallagher (69kg) and Eamonn O'Kane (75kg) were the golden boys for the tiny nation. Traditional powerhouse England went back a disappointed team despite collecting their 50th boxing gold medal at the Games. Only two out of their five fighters on view in yesterday's finals secured gold medals, a sharp fall from their haul of five gold and a silver four years ago. Australia fared even worse, with none of their 10 boxers being able to progress past the quarterfinals. For India, Paramjeet Samota rounded off India’s best-ever boxing campaign at the Commonwealth Games, as he outpointed Trinidad and Tobago’s Tariq Abdul Haqq 5-1 in the final bout of the Super Heavyweight (91kg) category at Talkatora Indoor Stadium on Wednesday. Samota, a Bronze medallist at the Asian Championships in Zhuhai, China in 2009, led the fight from start to finish. With the crowd carrying him though in the final moments of the bout, Samota gave India an all-win record on the final day of the competition. He was 3-0 up in the first round and made it 5-0 by the end of second, finishing with a 5-1 decision.